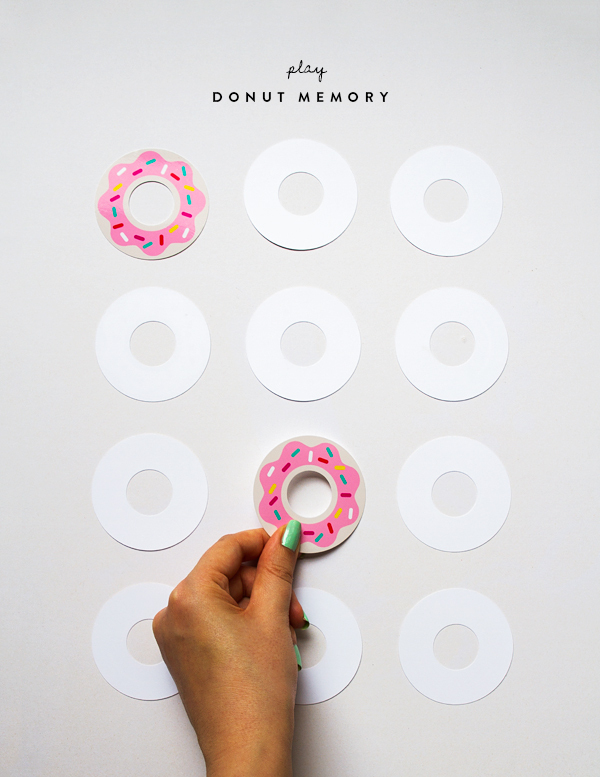 Create a game of ‘Donut Memory’ for guests to play at your party. You can also package them up as a gift or party favor. Use as a gift tag or decoration for gift wrap. 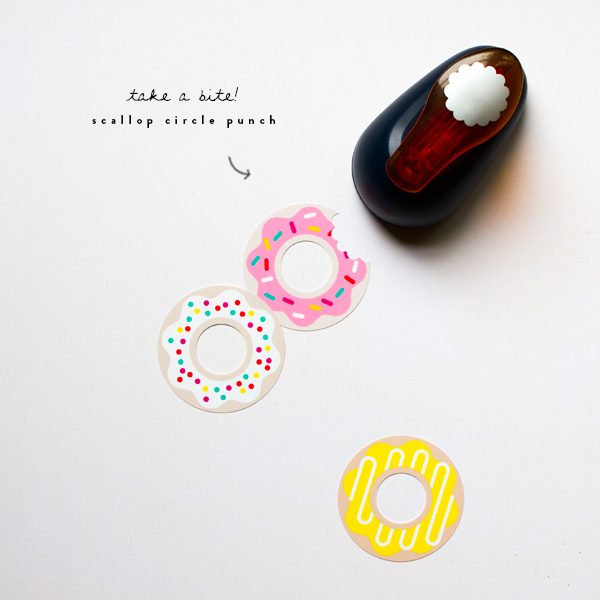 Print onto sticker paper to create donut stickers! How about really big donut confetti!! Can you think of other creative uses? Let me know! Step 1: Download the PDF at the bottom of this post and print out onto card stock. Note: Do not use Mac Preview to view or print the PDF, as colours may come out completely wrong. Use Adobe Reader instead. Make sure in your printer setup that your print quality is set to ‘high. 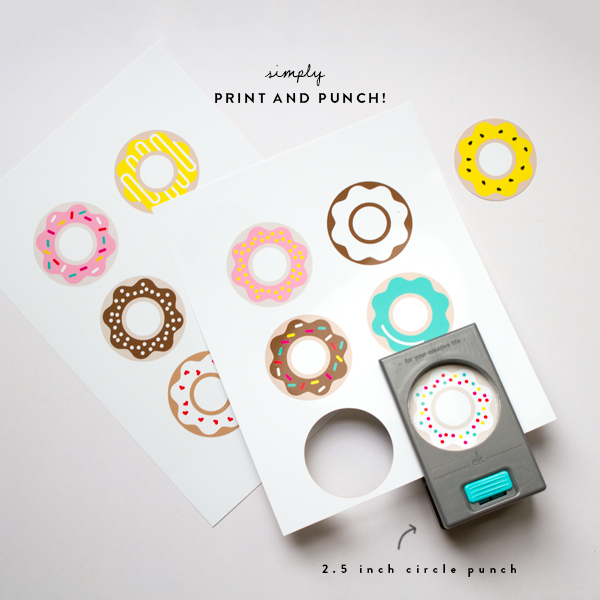 Step 2: Use a 2.5 inch circle punch to cut out the outer circle and a 1 inch circle punch to cut out the inner circle of each donut. Note: You may need to trim the paper down so that your punch can reach the correct spot. In particular, the 1 inch circle in the middle will need a punch that can reach the donut centre adequately. Some punches may not be long enough. I have found that the EK Tools 1 inch punch works perfectly. 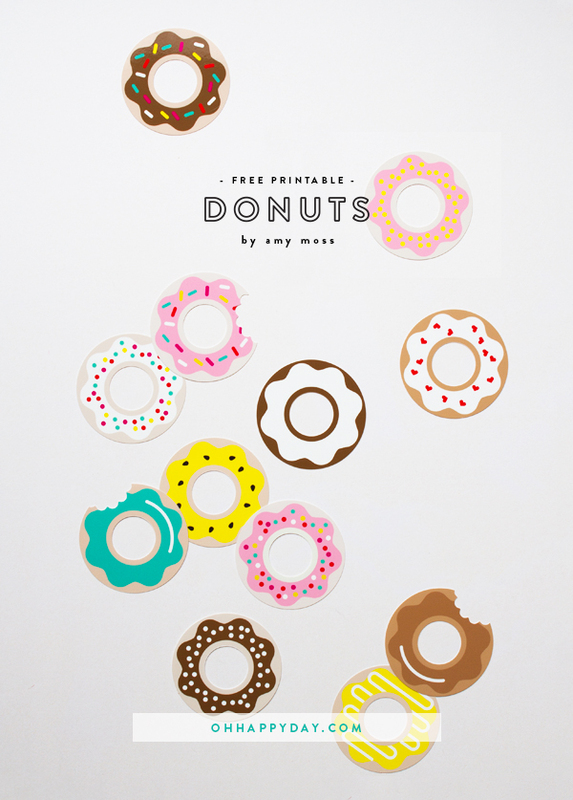 These would be so perfect to use with toddlers and preschoolers for that children’s poem/song “Down around the corner, at the donut shop…” You could even stick on a little velcro to use them with a felt board! The pink one reminds me of the Simpsons – so cute! I love the idea of donut memory. My niece would love these! And I think I should invest in a circular punch. Who doesn’t love donuts? Such a great party idea! Big fan of all things donut Thanks for these love ’em!! How sweet they are! love it! amy, how perfectly clever!! love the multi-usage and the adorable styled photos… so so cute! Brilliant! And how good is Amy Moss – hooray for sharing her amazing creativity! My boyfriend graduates from police academy in July. 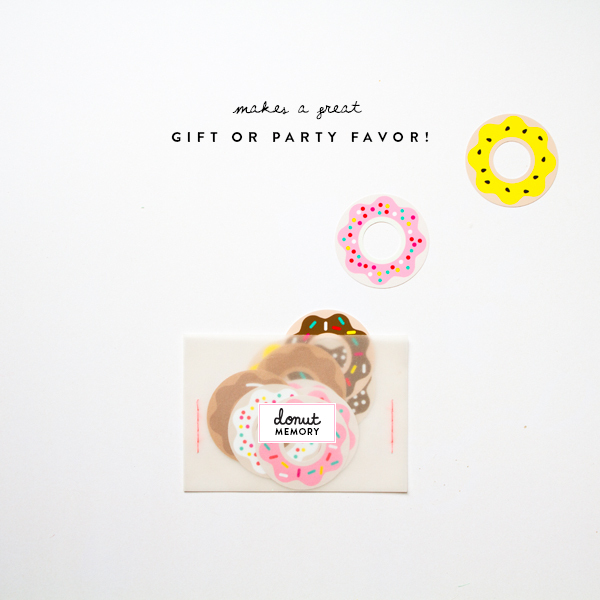 I can’t wait to surprise him with donut decor all around his house! Where were these when I taught pre-school? I made my own, but yours are “prettier”. I was able to copy the first printable page to my word program as seen, but the second page copied with a black background! Boooo! I cannot seem to get rid of the black background! Waste of Ink! ***I am planning on sizing these down smaller to use for making necklaces! I want to size them wrist-size, glue them back to back, cut a line through, so that they can be bracelets also! 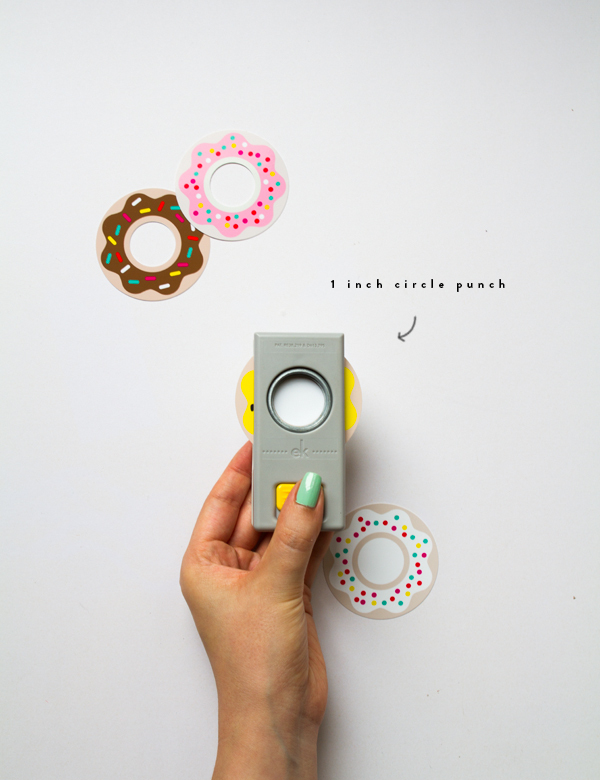 ***I want to size them larger, probably two halves, to make donut purses! 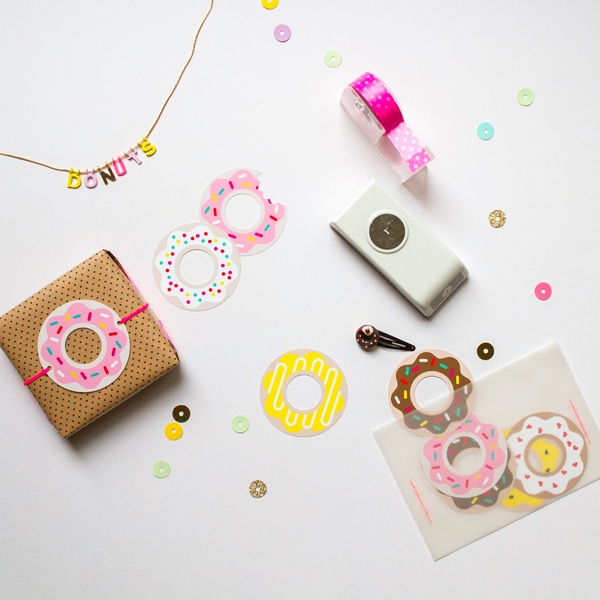 ***And of course, donut picture frames! I am sure I will come up with a few more ideas, now that I can modify the sizes. I just wish page two copied like page one! OOPS! That’s MICHIGAN! So used to using MI, it seems I forgot how to spell! 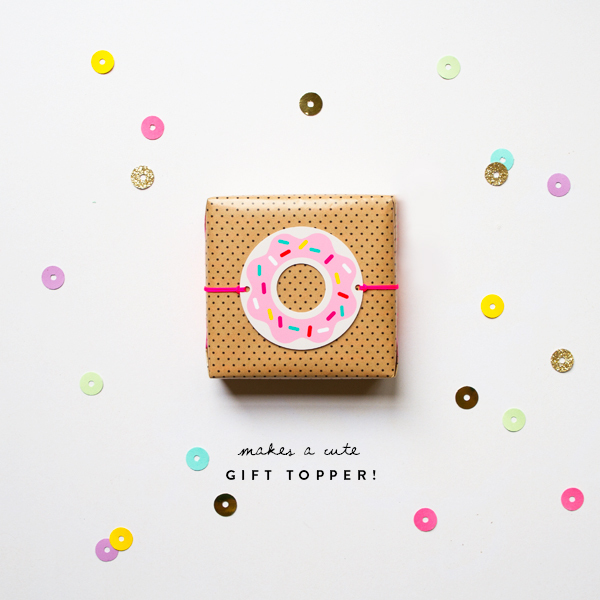 I love the gift topper suggestion! Super cute. Perfect for a sweet sweet lunch. High tea! There is so much to love here! 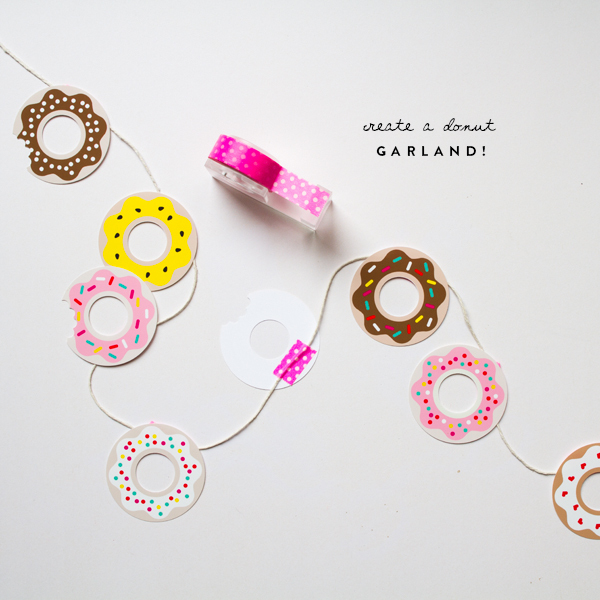 I plan to make that adorable garland and print another to use as gift tags. I am currently using this template as my iphone wallpaper and I couldn’t be happier. Thanks so much! I love them!!! Reminds me of my donut card! I am in love with these. Donuts are so cute. I’m going to use these to decorate a gift for my friend’s birthday next week. Thanks for the freebie! I was wondering what you meant by “donut memory,” and then I saw the picture. It’s like that match game where you have to flip things over and find the match, right? Just with donuts! Obviously, the prize for winning should be a real donut!